Joseph Iadone, a master lutenist, died on March 23. Cause of death was not released. He was 89. Largely self-taught, Iadone studied Elizabethan techniques he found in historical treatises. He received bachelor’s and master’s degrees from the Yale School of Music, and joined Yale’s Collegium Musicum, a group that performed classical music on historical instruments from the Metropolitan Museum of Art. In the 1960s, Iadone co-founded one of the country’s first early-music workshops at Windham College in Vermont. He trained an entire generation of lute players until the program ended in 1978. Iadone spent the next 22 years teaching at the University of Hartford. In 2003, he donated his four lutes to Yale and Quinnipiac universities. Joe Iadone was my only teacher and friend. I was told recently that he said that I was one of his best students. There is much to say about him. The best musician I have ever met. One story in the news says that he was largely self taught. This is incorrect. He was a student of Hindemith while at Yale. With a teacher like Hindemith one does not need another. Mr. Iadone was a scholar and tireless reseacher. I worked under him for some years. The best recording I have ever heard and I own is one with Norma Verilli(harpsichord), his wife before Susan. Norma herself is a very gifted musician. This recording I made at Housatonic Community College. Of interest to many I think is that he rarely took private students. The reason is that most students in his opinion, were lazy and wanted to be spoon-fed, without putting forth any effort. There are many other things to say about him that would be many pages. He was a friend to me and I will miss him greatly. By the way, he taught me privately for free for about 8 years. He would not take any money from me, so I at times assisted him on various projects. One of my fond memories is playing the entire H. Finke Mass with him in his home, we taking turns playing the lines of this marvelous 3 part work. A couple of months ago I read the announcement of the death of one of these pioneers of the revival of the lute, Joseph Iadone. Is there any portrait of him available, especially one of him playing his lute. 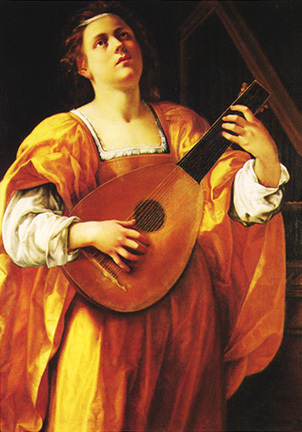 I’m preparing a series of articles about the Romantic view upon the lute in the late 19th and early 20th century. I only knew Mr. Iadone for a short time as a student at the Univ of Bridgeport, in the late 70s. We were the only theory class not studying chord patters, rather, increasing our rhythmic capabilities. I find myself using his terms and having my students clap out everything. He used to hold up his hand and tell us about Hindemith. I am fortuante to have studied with him for a short time, and will always think of him with a smile. Joseph Iadone was my friend for 55 years, my colleague and collaborator for 30 years and my husband for 10 years. I am proud to have been all three! He was unique among musicians and anyone fortunate enough to have performed with him will attest to that. He was a dichotomy of scholar and natural jazz musician, and he brought all of this into the “uptight” world of early music, and literally shook it all up! Until Joseph Iadone, it simply reeked of precious little “tinker toy” sounds, devoid of any emotionalism. It will never be the same again as he has left his indelible stain on the once sterile approach to the performance of all early music. He touched many lives, in many ways, and he will be quoted for generations to come with his famous “Iadonisms”. I stumbled across this site quite by accident, while doing a “Google.” I feel I should take this opportunity to add my thoughts. Joe, I’ve heard so many times, was the quintessential educator: one who instilled a sense of appreciation of his art while carrying it to the next level. He was tireless in his quest for the “perfect” music, and,if he had not passed on last March, he may well have found it. I, and my brothers Mark and Paul – his sons – were lucky enough to have had the music gene passed down to us. While not on the same level as Joe, we still have found our particular niches in the field, and will always be appreciative of having had it as part of our lives. I had the great pleasure and honor to study double bass with Joe Iadone for two years at the University of Colorado (1948-1950) while Joe was principal bassist with with the then-nmaed Denver Symphnoy. I had had atrocious teaching until then and Joe started me “from scratch” as a college junior.Painful but oh so beneficial. He turned me into a competent bassist which took me to many wonderful heights. I was able to speak with Joe shortly before his death—we both cried ! I was saddened to see that Mr. Iadone had passed away. Two years ago, I was trying to connect with him, but couldn’t find what he was doing. I was a student of his at Hartt. One of my favorite stories was that Mr. Iadone always wanted us to bring our tuning forks to class, said he would fail us if we forgot it one day. I didn’t worry too much, because I had perfect pitch, but one day I forgot it. And wouldn’t you know, he called on me. I didn’t know what to do, so I grabbed my pencil, whacked it on the desk, and sand an “A”. He looked at me and burst out laughing. He then said “Valenti, ha, ha, you don’t have to bring the fork anymore.” And I didn’t. this was one of my best friends i ever had..
he was my teacher …..
i used to go to his apartment for lessons at the time he was stayin in S. Fla.
he was really the coolest kat… he didn’t even have a TV in his house , he only had books…and he would tell me .. I wish i was born in the renasiance.. He said that people today are like broomsticks with heads on them .. they have no real emotions. And he realized that the age of the Artist was long gone. he was in his 70’s when i studied with him.. we used to have great conversations and when it came time to pay him at the end of the lesson he would say Gary you dont have to give me anything…. im’ cryin; tweetes as I remember..
when i lived in NY. i got in touch with him and i sent him some of the real music that i was recording and when i spoke to him on the phone he said ” Gary keep doing what your doing and he complimented me on the harmonies i used and he told me “remember this …(teachers teach what they don’t know)…unless they’ve been there themselves..
We would get into philosophical conversations about life and he would say that he was impressed with the fact that i was such a thinker. He said he didn’t know why life was the way it was but that he knew something intended it to be that way ..
he would say that when he performed on stage sometimes it was as though there was something that took over him and it was no longer he playing but the spirit . We really had some good times together ..
Joe was such a great man. I am not sure how I ended up sitting week after week studying with him. My friends Jeff Seres, John Zanella, Marc Trinkly and I all sat with him week after week studying music but always looking at life. Music was important to Joe but living a meaningful sincere life was even more important. Joe understood that he was mortal and always wanted to be part of the spiritual world that understood continuity. He wanted to pass on his values to those who would also pass them on for generations to come. He would always tell us “Boys – you must stay current – know what is going on around you” . He would say – ” Go after things- don’t just sit there. Rhythm does not simply exist – you have to go after it” . “Do don’t stew” . Music is still part of my life but the things that I learned from Joe are part of my soul. I loved that man and will always be greatful for what he taught me. His spirit lives on ! Dan, I recently completed my Memoirs of Joe Iadone. music,and has led to a very fruitful music career.Im sorry I never got a chance to thank him. I was a student in Mr. Iadone’s Ear Training class at Hartt College of Music 1971-72. I’ve never known a musician of his calibre since then. I discovered the information about his passing just tonight. I can recall the hours working on Hindemith material…..that always open little gray book. I still have it. I’m sure he is in Heaven…..and God probably fired all the harp players when he got there. Joe was the best musician I have ever run into. I worked with Joe in group setting for about 2 1/2 years. 3 to 4 students would get together 2 times a week and work on the Hindemith’s “Elementary Training For Musicians” Then we would look at our 2 part models from Hindemith’s counterpoint writing book. The highlight of these sessions was when we would play 3 to 4 part early music with him. His sense of time was increbible! He told me that he loved jazz musicians because they had great rhythm. Joe was a jazz and classical bass player before Hindemith encouraged him to learn the Lute. He played with Les Brown. I’ll forget when Joe played the jazz standard “Stella By Starlight” on the lute! I loved him an felt that I never played better than when he was helping me. Joe Iadone was my favorite teacher when I was at Hartt in the early 1970s. Collegium was always a blast and my sight-reading classes with him were the best. Someone earlier had posted his saying “peoples…. !” with a low-grade serious but self-depricating response when the class would make a mistake. When things really went wrong he would say, “let’s clear the air….Bach” and we would go right on to singing Bach chorales. Joe was unique among teachers at Hartt. He had already made his mark in the world of performance so he often got a kick out of the egos that walked the halls. He had a wonderful sense of humor. Even though it’s been more than thirty years since I saw him last I still think of the inspiration he gave me as I’ve tried to incorporate some of that in my own music teaching. As you go through life and learn things, there are always those great teachers who stand out and whom you can not forget. Joe Iadone was one of them for me. I will never forget the marvelous concert that he and his ex-wife Norma Verilli gave us students on harpsichord and lute – unbelievable, unique and unforgettable. Thank you both. Joe got mad and told us to stop the performance – humiliating us both. I always wanted to tell Joe that I knew my part in its entirety, and the other dingdong didn’t learn his part – but never got the chance. Anyway, rest in peace Joseph. We will never forget you. Men like Joe should live to 189 so that they can influence more people. After graduating with a music degree (with honors) in 1980, I knew I needed to study more musicianship and ear-training. A bandmate at that time recommended a certain teacher in Connecticut who was the best but would only take a certain type of serious student. After an interminable train ride from NYC, a bus ride and a long walk, I found Housatonic Community College in Bridgeport and Mr. Iadone, teaching in an empty uncleaned classroom after hours. We worked only from Hindemith’s books and his own transcriptions of every type of early music. For two years, 1981-3, I made that trip twice a month. The peak experience was a chamber concert on the Yale campus with Joe, Susan (his second wife) and Freddy Arico on cello! WOW! What a great teacher, coach, and inspiration! Thank you again and again, Mr. Iadone! I had the privledge to be in Joe Iadone’s ear training class from 1971-74. He was one of the best music teachers I have ever had. His approach to rhythm,especially, via the excercises in Hindemith’s Elementary Training For Musicians has stayed with me my entire life. He brought life to music, and music to life. I can still hear him saying “sub-divide”, and “Geez peoples, you make me so tired. At your age you should be bouncing off the walls. Can’t always fall back on pillows, ya know…hee hee hee”.I refer to him often in my own teaching. He was truly one of a kind. It was a great honor to have studied with Joseph Iadone. I met him in 1968, at the Collegium Musicum at Windham College in Putney, Vermont. Many of the finest musicians in Early Music today passed by this amazing musical adventure. I don’t think I would be a musician today were it not for the training I received here. Joe offered my a scholarship to study with him, and for years I would take the bus from NYC to Bridgeport. We played some great tunes. I think it is really impossible to describe the depth and value of his influence. His duet concerts with Norma were some of the finest concerts I have ever heard. I studied with Mr. Iadone (I never could call him Joe when I spoke to him) at Housatonic College and the University of Bridgeport. If you knew him, you get it. We are part of a lucky fraternity who was exposed to greatness. If you had a clue, he impacted your musical life forever. If you never knew him you missed a very special person. I remember him giving me reading assignments above and beyond the normal class work. After or before class we would go for walks around campus and talk about what I read. No matter how much I thought I knew, I never scratched the surface compared to Mr. Iadone’s knowledge. I used to drive him to his favorite bread store in Bridgeport. He was a bread connoisseur. He helped me develop my love of fine fresh breads. While I am sure I dropped more pearls than I was able to hold on to, Joe is at the core of the musician I try to be. If my teaching passes on just a little of what Joe gave me, my students are the better for it. I can only echo the comments already made by others on this site. I was so fortunate to study ear training with Mr. Iadone in my freshman year at Hartt College (1971). I can still make the physical motion of striking an imaginary tuning fork against a tabletop, and in my mind’s ear, a pure A 440 sounds!! He was a profound influence on my critical judgment of music and musicians. He loved and respected early music and jazz, equally. My piano teacher at Hartt, Charlie Gigliotti, used to tell me many funny stories about playing with Joe Iadone, which only made me love both of them more. He was the quintessential “pure” musician: as Jane Grimaldi, my old friend, said, “He brought life to music and music to life”. Requiescat in pace, maestro. I just received a copy of “The Art of the Lute” of Joe Iadone. If you do not have a copy, pick one up to hear this giant musician. I will miss Joe and look forward to seeing him again in the future. My favorite story about Joe Iadone was while I was in his ear training class, he insisted we all carry our tuning forks with us at all times. But we were NEVER to not have them in class. One day I forgot mine, and that was the day he called on me for the “A”. Having perfect pitch, I picked up my pencil, struck it on the desk and sang the “A”. He laughed so hard. I never was required to bring in the fork again. I lot of people who knew Joe come here. I am looking for recordings that you may have of Joe and Norma Verelli. If not, anything else with Joe playing.